asdfghjkñ: Do you know Vanessa Villamizar? Do you know Vanessa Villamizar? Well, she studies with me in English for work.. She is from Venezuela, Maracaibo specifically. She is 19 years old and she study Graphic Design, just like me! She loves reading, dancing, going out with her friends and hanging out with her family.. She likes junk food, the beach and traveling.. lovely. But.. 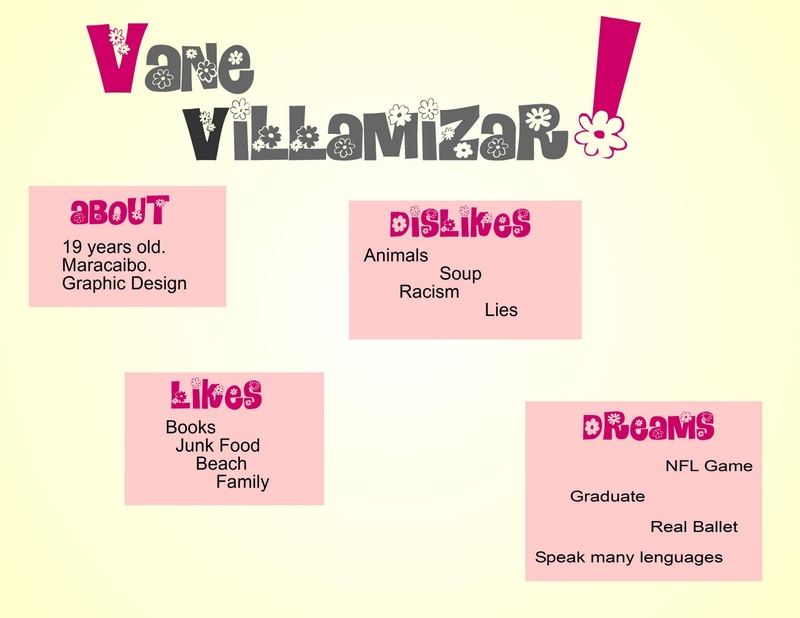 Sadly and REALLY, REALLY SADLY: she dislikes animals..
She hates soup, clowns, violence, racism, lies and people who think graphic design is just about cutting and pasting papers. Talking about her goals, she told me that one of them is to graduate and and be a good professional, also she dreams to travel around the world, go to a real ballet and to a NFL game. She would love to be able to speak many languages. That's why she thinks english is very important and beautiful. She learns it everyday listening to music, watching tv shows or movies and she tries to speak and improve herself and her english all the time. So, i hope you all know Vanessa now.. here I posted a picture of Vanessa and her friend, Vero.